Thankfully, the snow left as quickly as it arrived this time. Today we have a clear blue sky, however, with a -3c frost, the ground temperature is 5c below this time last year. This together with the recent heavy rainfall, to my mind has put us back about 6 weeks. Today is the first time I have managed to carry out any work on the greens. 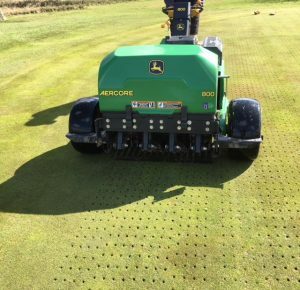 We are solid tining them, to a depth of 4″, allowing much needed air into the soil profile and to aide surface drainage.